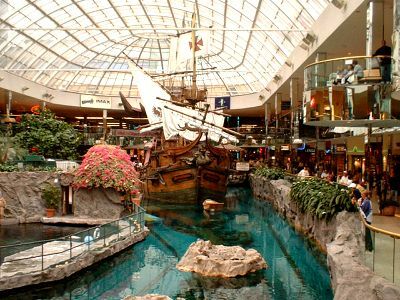 West Edmonton Mall, located in Edmonton, Alberta, Canada, is the world's largest indoor shopping mall. 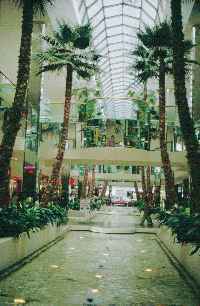 The Mall first opened its doors to the public on September 15, 1981. It has been expanded three times since its opening in 1981, with these additions completed in 1983 (Phase II), 1985 (Phase III) and 1999 (Phase IV). West Edmonton Mall has a gross area of 500,000 m² (5.3 million ft²) and it cost CDN $1.2 billion to build. More than 800 stores and services are located on the two main floors, including 110 eating establishments. There are six anchor tenants (department stores and junior department stores), in addition to six other major stores including The Brick, London Drugs, Sport Chek, Chapters Books, and Winners.